In December of 1799, a terrible storm hit the northeast coast of England and Scotland. Monstrous seas ripped ships from their moorings and slammed them up against the coast. Out in the deep water, ships still at sea were tossed and crushed by gigantic, violent waves. By the time the storm let up after three days some 70 ships had been sunk and the lives of many seafaring men had been lost. In Scotland, the Firth of Forth, the bay of Scotland's River Forth, would have provided a haven for many ships in danger from that terrible storm. However, none dared approach it because of a treacherous quarter-mile-long reef there called the Bell Rock. Emerging from the water for only short periods during the day, most of the time Bell Rock lay invisible just below the waves, ready to rip the bottom out of any ship that made for the safety of the bay. The rock was considered so dangerous that many ships chose to risk riding the storm out at sea rather than try to make it past the reef to safety. Fear of the reef (which was also known by the name of Inchcape Rocks) was instilled in sailors long before the great storm of 1799. According to some sources in the 14th century, the Abbot of Aberbrothock, John Gedy, and some of his monks sailed out to the rock with an enormous bell. They successfully attached it to the reef so that the waves would make it ring continually, giving ships an audible warning. The bell stayed on the rock for only one year, however, before it was stolen by the Dutch pirate "Ralph the Rover." Ironically, according to the story, the pirate himself perished on the rock when his ship broke upon it because he had taken the warning bell. -Location: On the Bell Rock reef 11 miles off the Northern Coast of Scotland. -Height: From the foundation to top is 115 feet, 10 inches (35m). -Made of: Granite and Sandstone. -Construction Dates: August 1807 to February 1811. -Construction Crew: Approximately 110 men. -Other: Construction of the lighthouse claimed 5 lives. The bell had one lasting effect, however. It gave the dangerous reef a name that would last through the centuries. No further attempts were made to place a warning device on the rock for hundreds of years. 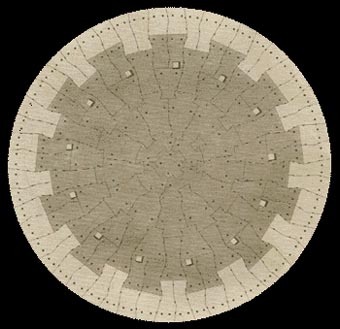 In the late 18th century, however, the Northern Lighthouse Board was established. By 1795 there were seven major lighthouses along the coast of Scotland. However, the Bell Rock, which was under sixteen feet of water at high tide, was still considered by almost everyone too difficult a place upon which to build a lighthouse. However a young engineer named Robert Stephenson felt differently. Stephenson was employed by the Board to inspect and repair the existing lighthouses and survey locations for new ones. He was intrigued with the idea of placing a light on Bell Rock, but many members of the board felt that it was simply impossible and would not entertain his proposals. The disastrous storm of 1799, however, showed that many ships and lives might be saved if only a warning light could be built on the reef. In October of 1800, Stephenson finally found a fisherman brave enough to take himself and architect James Haldane the 11 miles out to the rock for a couple of hours to take a closer look at it. The pair found that the part exposed at low tide was about 250 feet long, 130 feet wide and composed of sandstone. Stephenson had gone out to the rock expecting to build a structure over it supported by pillars, but then determined after his examination that these would never stand the pounding of the storm waves. Instead, Stephenson decided to take a page from the book of engineer John Smeaton who designed the Eddystone Lighthouse near the port of Pymouth. A diagram showing the interlocking stones at the base of the lighthouse. The Eddystone Lighthouse had been built in 1759 on an exposed rock that was swept by the sea. Two earlier lighthouses on the same location had tragically collapsed, but in his design Smeaton had used a clever scheme of interlocking heavy granite blocks with dovetail joints and marble dowels to ensure that the stones could not be pulled apart even by the most powerful waves. 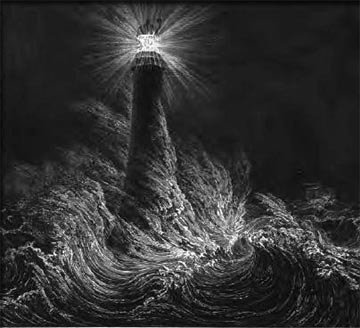 He also gave the lighthouse an inward, curved shape similar to an oak tree trunk which he thought would resist the sea. His structure was successful and inspired Stevenson to use a similar design on Bell Rock. However, the Bell Rock construction would be considerably more difficult than what had been done at Eddystone. The rock at Eddystone was above sea level under normal conditions whereas Bell Rock was covered by nearly 16 feet of water at high tide and was only four feet above the waves at low tide. This meant that the new lighthouse would need to be at least 20 feet higher than Eddystone, with a correspondingly larger base. This 40 foot wide base meant that more than 2,500 tons of stone would be needed to build the tower. Stephenson estimated that the cost would be a staggering 42,000 British pounds. Because of the high cost, the lighthouse authority was reluctant to pursue the project. Then, in 1804, the 64-gun man-of-war, HMS York, went missing on a routine patrol in the North Sea. It was later determined that the ship hit the rock and sank with all 491 hands on board. Despite this, resistance to Stephenson's plans continued as it was thought that he was too young and untried to take on such a difficult project. 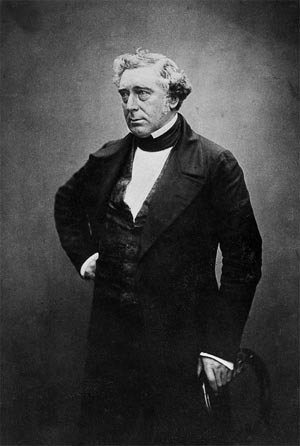 Stevenson finally wrote a letter about his plan to John Rennie, one of the most well-known civil engineers in the country. Rennie looked over Stephenson's materials and was impressed. With Rennie involved, approval was finally forthcoming, with Parliament passing legislation allowing the board to borrow $25,000 pounds to cover the cost. Rennie was put in charge, with Stephenson as his assistant. 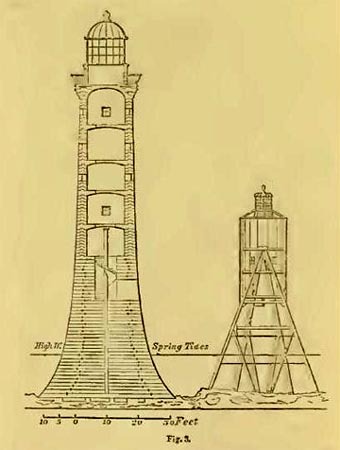 A diagram showing a cross section of the lighthouse and the associated beacon house. Despite Rennie and Stephenson agreeing that the design was workable, there were a lot of unknowns about the project. 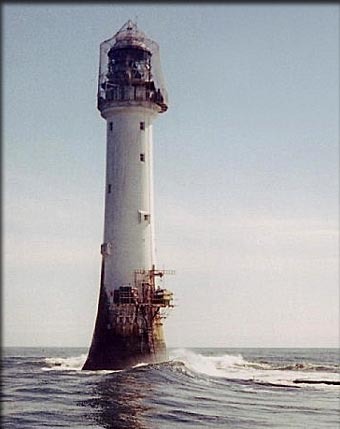 Nobody had ever attempted to build a lighthouse where the base was so far underwater and the location was so distant from land. How would they house the construction crew? There were three vessels that would be involved in the erection of the lighthouse. The "Pharos" (named after the Pharos lighthouse of ancient Alexandria) was 67 feet long and would be moored about a mile and a half to the northwest of the site to act as a temporary floating lighthouse during construction. The "Smeaton" (55 feet long) was especially built for the project and served as a tender for the floating light as well as a way to transport the giant granite blocks out to the site from the mainland where they were being cut and shaped. It was decided that a third ship, the "Sir Joseph Banks", would be built to house the construction crew. However, the "Joseph Banks" was still under construction on the day the crew started out to the site on August 17th, 1807. The crew was instead housed on the Smeaton and later the Pharos. Only a few hours of work could be done twice a day a low tide while the rock was exposed. The crews were expected to live on the ships for a month at a time while construction was underway and row out to the rock in small boats during the work periods. A near disaster occurred early on when the Smeaton broke its moorings and could not be brought back before the crew working on the rock would have been drowned by the incoming tide. Fortunately, a supply ship happened to arrive from the mainland at just the right time, saw the crew's desperate situation and came to their rescue. By the last day of work that first season, October 6th, the crew had raised a temporary, cone-shaped platform called the "beacon house" that they hoped would last through the winter. Bell Rock today. (Photo by Derek Robertson licensed under the Creative Commons Attribution-Share Alike 2.0 Generic license). When Stephenson returned on May 25th, 1808, he found the beacon house still standing. The first work he and his crew set out to do was to excavate a round, two foot deep foundation pit in the rock where the first course of granite stones that made the base of the lighthouse would be laid. To get the stones from the ship to the location, Stevenson also had the men lay a 300 foot long set of iron tracks. It took the enitre summer working season, but by fall, three courses of stones had been laid and the lighthouse rose four feet above the reef. As construction continued, Rennie spent less and less time on the project, finding the difficult and dangerous conditions at the site not to his liking. This was fine with Stephenson, who always thought he had more experience with building lighthouses, anyway. He became the de facto head architect, often working from his own designs and ignoring Rennie's plans. During the third season the beacon house was expanded and some of the men took to sleeping there rather than rowing back to the Sir Joseph Banks for the night. They may have regretted this one evening when a heavy storm rolled in and the men spent 30 hours in a gale, clinging to the precarious looking construction. Though the house took some damage, both it and the men survived. Despite bad weather that summer, by the end of August the solid bottom of the lighthouse was finished. It towered 31 feet above the rock with the top seventeen exposed even at high tide. In the spring of 1810, Stephenson was determined to finish the lighthouse by that winter. As the lighthouse climbed into the sky, however, the work became even more difficult as high winds whipped around the workers as they clung to a narrow scaffolding, working mortar into joints in the exterior masonry. Even with this difficulty, by the end of July the lighthouse had reached the height of 102 feet as the last stone was put in place. A heavy storm in August caused damage and delayed the completion of the interior for the lighthouse, but by the end of October most of the lighthouse lamps, reflectors and 'fog bells' were in place. The one thing that was missing were large sheets of red glass that would be used to color the light so that it flashed both white and red as an identification code, signaling to ships that this was the Bell Rock beacon. By February 1, 1811, the final pieces were put in place and the lighthouse was put into service, forever ending the danger to sailors of the reef underneath it. Four keepers maintained the light, three at any one time out at the site, while the fourth one was on leave on the mainland. Though the beacon was automated in 1998, the lighthouse still stands today, the oldest offshore light still operating in the world. It is a monument to Robert Stephenson who designed it, and the brave men that built it. It endures as an engineering wonder of its age. Copyright Lee Krystek 2015. All Rights Reserved.